For some now forgotten reason I decided that I wanted to make croque monsieur and croque madame sandwiches. I realized that I didn’t have the right bread. American white sandwich bread is such a lump of dough that it wouldn’t hold up to the other ingredients. Artisanal breads also didn’t sound right. The only thing that would really work is French sandwich bread – pain de mie (“soft-in-the middle bread”). It also goes by the name of a Pullman loaf in the USA. I grabbed onto that idea, because my pain de mie pan, complete with lid, had been gathering dust. There really is no bread that will substitute for pain de mie: if has a fine crumb, the crust is soft and brown, it cuts so easily that you can turn it into thin Melba toasts, it toasts beautifully, and it has a delicious flavor not remotely the same as American sandwich bread. Besides all that, it is a kitchen gadgeteer’s dream because of the special bread pan with a lid. Of course, if you don’t have such an implement, you can fashion your own with a regular bread pan and some sort of lid – a tile or small metal pan that can serve as a lid. You will also need a weight. I used a piece of flagstone from our yard. If you want to make the investment in the pan, you may have a hard time finding it at your local kitchen store. Fortunately the pans are readily available by mail order or on the internet. I bought mine from King Arthur Flour . They sell two sizes of the pain de mie pans complete with lids. The smaller size measures 9 x 4 x 4 inches and sells for $29.95. The larger pan measures 13 x 4 x 4 inches and sells for $34.95. This recipe is designed for the larger sized pan. You should use a flour with lower protein content. Don’t use bread flour. All-purpose flour will work, but Southern lower-protein flours like White Lily, Martha White or Gladiola, are even better. Potato flour, made from ground dried potatoes and also called potato starch, adds moisture. Powdered milk also adds moisture along with a little sweetness, but it may prevent the dough from rising as fully. Butter should be unsalted, and it should be softened to room temperature so that it can be readily incorporated into the dough. Be sure to pre-heat the weight so that baking of the bread is even. In a large bowl, combine the milk, water, butter, salt, and sugar. Then add the dry milk, potato flour, and yeast, stirring with a whisk until well mixed. Add 4 cups of the flour, one cup at a time, stirring until the flour is completely incorporated and the batter pulls away from the side of the bowl. Turn the dough onto a clean work surface dusted with the remaining ¾ cup of flour. Knead until the dough is smooth and elastic, about 10 minutes. Then place the dough in a greased bowl, cover with plastic wrap, and let rise in a warm place until doubled, about 1½ to 2 hours. After it has risen, turn the dough onto a lightly oiled surface, deflating it gently. Let rest for 10 minutes. With the palm of your hand, flatten the dough into a rectangle that is the length of the pan and about twice as wide. Fold in half lengthwise, and pinch the seam closed tightly. Place the dough, seam side down, in the well-greased pan. Also, make sure the under-surface of the lid is well-greased. The dough should come up to no more than 1/3 of the height of the pan. Place the lid on the pan, leaving it open several inches. Cover the opening with oiled plastic wrap and let rise for the second time until the dough comes to about ¼ inch below the lip of the pan, about 1½ hours. Remove the plastic wrap, carefully close the lid, and let rest for another 10 minutes. Be very careful not to deflate the dough with the lid. Bake for 30 minutes in the middle of the oven at 375°F with the weight placed on the lid. After 30 minutes, remove the weight and lid, and bake for an additional 15 minutes. The loaf should register 190°F with an instant read thermometer. Remove from the oven, let rest for 10 minutes, and then turn onto a cooling rack. Cover with a clean cloth and let cool completely. For a recent dinner we shared with friends, I was tasked with the salad. I decided to make a quinoa and three-bean salad. One of the ingredients was these pickled mushrooms. I was concerned that a single post with all of the food and preparation would be too much, so here is the mushroom recipe. The quinoa and three-bean salad will follow shortly. This is a very old recipe that is based on one I got from the wife of an office colleague nearly forty years ago. It is – for sure – straight out of the 70s. On the other hand some things that are old never lose their luster if they are good to begin with. I think this recipe qualifies. Originally, the mushrooms served as a bite to go along with cocktails. You can use them that way if you like, but you can also put them in salads or as a garnish for vegetables and side dishes. 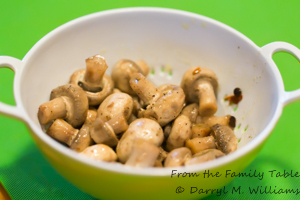 One of the most important tricks of the dish is to buy the smallest mushrooms you can find. Even though they shrink when you boil them, you don’t want a giant mushroom hanging off the end of a cocktail pick. If you can’t find small mushrooms, halve or quarter the ones you do find. In a large pot, bring the water to the boil, add the lemon juice and then add the mushrooms. Return to the boil and boil for 3 minutes. Drain, cool, and set aside. Meanwhile, prepare the pickling mixture by combining all of the remaining ingredients in a large bowl. Stir the mushrooms into the pickling mixture. Marinate in the refrigerator overnight, stirring from time to time. Drain. Rinse off the pickling spices with a brief spray of water. Serve as an appetizer or use in another recipe. Snow is on our local mountains, so winter is not far away. The farmers market has all but closed except for apples and a bounty of winter squashes – pumpkins, acorn, and butternut squashes. That means lots of soup, pies, and acorn squash roasted with maple syrup or brown sugar. My favorite squash is spaghetti squash, because it is so versatile, and the strands hold their crispness even with cooking. We usually eat it with just butter, salt, and pepper. Of course, you can substitute it for spaghetti with marinara. I decided to do a riff on a pasta dish that Jacques Pépin demonstrated years ago on his television show. That recipe has become a favorite, especially when we are in a hurry for lunch or a light dinner. This time I just substituted spaghetti squash. Bake the squash in the middle of the oven pre-heated to 350°F (190°C) for 1 hour. Test for doneness by piercing with a sharp fork. The squash should be tender. Remove the squash from the oven and let rest for 5 minutes until you can handle it comfortably. With a large, sharp knife, cut the squash in half lengthwise. Scrape out the seeds. Then, with a fork, scrap out the flesh into a bowl. The squash will form spaghetti-like strands. Stir in the butter, olive oil, Parmesan, and parsley. Season to taste with salt and pepper. Place individual servings in pasta bowls and top each with two poached eggs. You should be able to make four servings.